IREPS e-Tender: How to upload and attach Vendor's Public Document? IREPS provides facility to vendors to maintain an online repository of their documents like RDSO/NSIC etc. approval certificate and any other regular documents supporting their credentials. Once these documents uploaded in online repository then these can be attached by vendor in any no of tenders. After login, click on the link 'View/Upload My Documents' available in the left navigation block under Quick Links. Add a description and click on Select File to Sign &Upload button. Browse and select the file to upload and click on Sign button. After successful upload you will the message 'File Uploaded Successfully'. 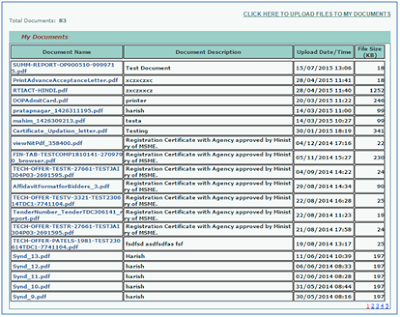 To see the list of uploaded documents click on My Documents List. Select the document from the list and click on the Sign & Add to List button. There were some problem on IREPS website and they had resolved the problem in few hours on the same day.